With our Thanksgiving holiday less than a week away, the inevitable overindulgence of delectable foodstuffs is close enough to taste. 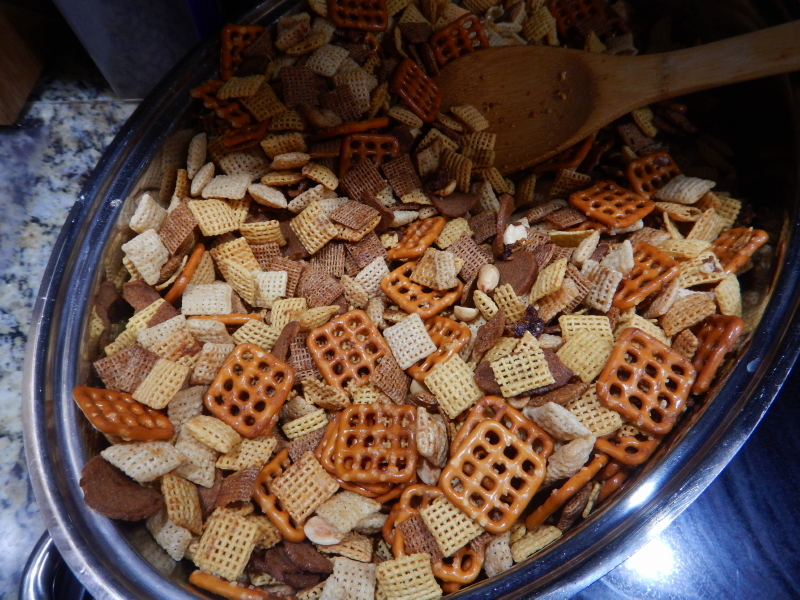 Yesterday, Cyndie unleashed the first assault with one of my all-time favorites: Chex mix. The most difficult healthy change I made in my diet when I decided to monitor my daily sugar consumption was to control how much cereal I ate. Sure, I love ice cream as the absolutely best treat around, but I even garnish some of the best scoops with Grape-Nuts cereal to take it over the top in extravagance. Admittedly, one of my big reasons for loving cereal so much is the fact it is ready-to-eat without cooking. Can you say instant gratification? Unfortunately, most cereals are also high in sugar, among any number of other less than ideal potential additives. While I used to avail myself of unfettered bowlfuls, my servings now are precisely measured to keep portions at or below 10 grams of sugar per meal. I have one other persistent craving. I like snacking almost more than a meal. Appetizers are better than dinner. Finger foods are the best! Yesterday, the house smelled amazing. There was a fire in the fireplace and Chex mix baking in the oven. Butter and salty spices slathered all over the cereal, pretzels, garlic chips, and nuts, slowly roasting. This morning the giant oval roasting pan filled with gold sits atop the stove and I am desperately trying to pretend it isn’t there. I already snitched a double-dose beyond my ration yesterday, so I would like to demonstrate a little more restraint today. Cyndie is gone for the day, so I had a very respectable serving of some banana nut crunch flakes for breakfast. Two bowls of a half-cup each. Ten grams. I closed the box and put it away. Washed my bowl. Then I lifted the lid on the roasting pan, just to see if the treasure was still there. I told Cyndie yesterday that I noticed she forgot to include any Cheerios. As if that will make it any easier for me to resist. Oh for the love of cereal. Seriously!!! You told her she left something out??? Well, I think I posed it as a question, but, yeah, I guess I did. Stephanie is good at saving me from such blunders with Victoria … mostly… but I often don’t get it until it is too late. The truth is that we are pampered into it, believing we can’t get too much of a good thing that really gets better and better, leading to the inevitable doomsday. Thank goodness for our wonderful spouses’ forgiving nature! At least so far….